If you have found yourself cleaning out your children’s playroom and up to your ears with books, you might be wondering what to do with all of them. Unlike clothing, children don’t typically outgrow books, but books can run their course. Perhaps over the years the spine has become lose, or the pages ripped, stained, or torn. Perhaps someone decided to take a marker to them, or maybe you even have some duplicates. Whatever the reason may be, you might find yourself needing to eliminate them from your collection. But before you send them off to the trash can, take a peek at the many ways to reuse children’s books below! You may never have thought about reusing children’s books before. But there are actually quite a few things with books that seem hopeless. All it takes is a little creativity and thinking outside of the box! Ready? Gather those old books and take a peek at the many ways to reuse children’s books! Find some colorful illustrated pages and arrange them in a collage on the wall. Double sided tape is a great way to do this without commitment, or you can arrange them and cover with a coat of clear sealant for a more permanent fixture. It is just as decorative as painting a wall and much cheaper! 2. Make a treasure chest. Thicker books can be made into a treasure chest. Just remove the pages wrap the book spine around a flat box. You can put the book right back on the shelf and no one will know it is hiding a treasure box! 3. Create instant wall art. Tear out and frame some of your favorite pages and illustrations. Use thrift store frames and it is much cheaper than buying store bought art at $20.00 and up a pop! Plus this way it is much more personal since it will feature some of your favorites. 5. Use as scrapbook accents. The illustrations in books make great scrapbook accents. Cut out fun pictures or sayings and apply them to your scrapbooking pages. They will add instant art and colorful charm. 6. Make a child friendly room divider. Find an inexpensive photo room divider at a thrift store or yard sale. But instead of putting photographs in the slots, place their favorite illustrations. Then, place in a children’s room for an instant, child friendly room divider! 7. Make dinner table placemats. Tear out your favorite pages and coat with contact or laminate paper. This will now make it water proof and able to be wiped, so you can use it as a placemat at the dinner table. It will catch crumbs and spills and be able to be used meal after meal. Just like you did with the placmmats, you can make colorful coasters out of the pages of children’s books. Use the rim of a glass to trace perfect circles onto the pages. Then cut out and laminate as you did with the placemats. You can then use these to hold your damp drinks and protect your table top! 9. Use for small motor skill building. The pages of books are perfect to practice fine motor skills. Tear out pages and present to your child with scissors. They can practice cutting out shapes, cutting pages into strips, or finding and cutting out pictures that start with a certain letter. 10. Make mini flip books. Turn large books into smaller ones! 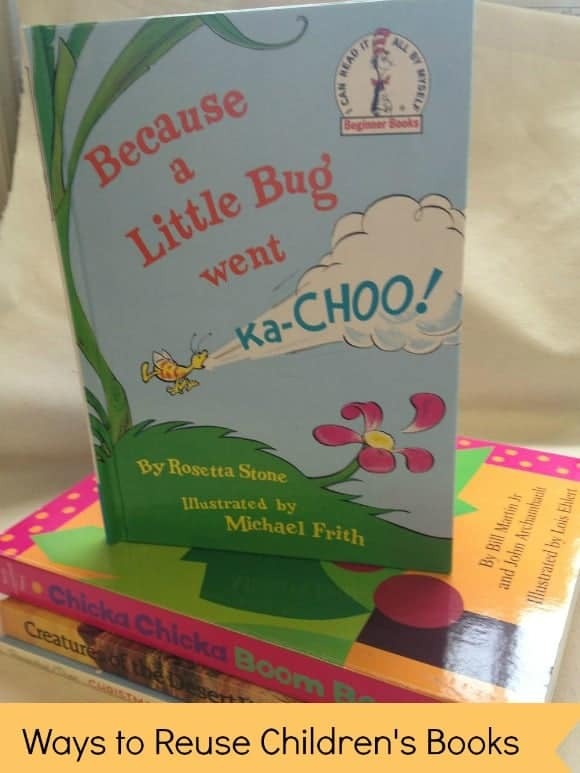 Have children collect their favorite pages and assemble them into a new story! Simply staple the new book together, flip through, and enjoy! Children can tell a whole new story when they create their own mini flip books! As you can see, there are many fun and creative ways to reuse children’s books! Just because they are torn, stained, or damaged, you don’t need to trash them just yet! Instead, use one or more of these tips and breathe some life into them you never knew they had! Books are truly a gift that keeps on giving every time you open one. Now, they can continue to give even after they are damaged. Don’t have any damaged books but still want to try these crafts? Just head to your local dollar store or thrift shop for a wide variety of children’s books for $1.00 or less. You can’t beat that! So gather those books and get started with these awesome ways to reuse children’s books! The sky is the limit with what you can create! Looking for more ways to repurpose your child’s items? Check out ways to reuse wipes containers! Plus, come back next week for another great post in our Repurposing Children’s clothing ideas Series. Do you have any great ideas for ways to reuse children’s books? We’d love to hear them! I don’t have kids, but I have lots of good memories of reading when I was a child, so I love repurposing the old books I find in the kids section of the thrift store. Right now, I’m turning kids hardbacks (especially old Nancy Drews) into Kindle cases. This post is coming at the perfect time! I was JUST about to get rid of a pile of books from the kids’ room, but now you gave me lots of ideas to re-purpose them! Thanks! These are excellent craft ideas that I’d never think of! Will definitely be trying some of these out. Great ideas here, sharing with my Mom group! These are such great ideas! I was just thinking I had to go through my sons books and get rid of some. Not anymore! These are some really fun ideas! They’d be great at home or in a daycare center or school. These are all great ideas. I really like the idea of wall art! These are some great ideas, great for my daughters old books,. These are excellent ideas! Thanks. I will use some of these. I might try the treasure box. Those are good ideas! It’s fun to use these to create instant wall art by taking several pages, placing them in different frames and making a grouping.